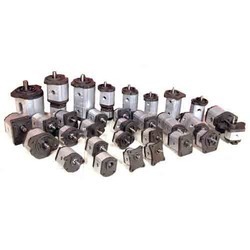 Our organization is highly esteemed in offering Hydraulic Gear Pump to our clients. Robust construction, topnotch performance and best construction are topmost points of this pump. It basically uses meshing of gear for pumping fluid by displacement method. This pump is also used in hydraulic power applications and is free from all types of defects. Experts have done rigorous inspection of complete range of this pump.